Assorted types of fluorescent lamps. Top, two compact fluorescent lamps, bottom, two regular tubes. Matchstick shown for scale. Unlike incandescent lamps, fluorescent lamps always require a ballast to regulate the flow of power through the lamp. In common tube fixtures—typically 4 feet (120 centimeters) or 8 feet (240 centimeters—the ballast is enclosed in the fixture. Compact fluorescent light bulbs may have a conventional ballast located in the fixture or they may have ballasts integrated in the bulbs, allowing them to be used in lampholders normally used for incandescent lamps. Since fluorescent lamps use considerably less energy than incandescent lamps, governments and industry are encouraging the replacement of traditional incandescent light bulbs with fluorescent lamps as part of sound environmental and energy policy. The earliest ancestor of the fluorescent lamp is probably the device by Heinrich Geissler who in 1856 obtained a bluish glow from a gas that was sealed in a tube and excited with an induction coil. At the 1893 World's Fair, the World Columbian Exposition in Chicago, Illinois displayed Nikola Tesla's fluorescent lights. In 1894 D. McFarlane Moore created the Moore lamp, a commercial gas discharge lamp meant to compete with the incandescent light bulb of his former boss Thomas Edison. The gases used were nitrogen and carbon dioxide emitting respectively pink and white light, and had moderate success. In 1901 Peter Cooper Hewitt demonstrated the mercury-vapor lamp, which emitted light of a blue-green color, and thus was unfit for most practical purposes. It was, however, very close to the modern design, and had much higher efficiency than incandescent lamps. In 1926 Edmund Germer and coworkers proposed to increase the operating pressure within the tube and to coat the tube with fluorescent powder which converts ultraviolet light emitted by an excited plasma into more uniformly white-colored light. Germer is recognized today as the inventor of the fluorescent lamp. General Electric later bought Germer's patent and under the direction of George E. Inman brought the fluorescent lamp to wide commercial use by 1938. A fluorescent lamp is filled with a gas containing low pressure mercury vapor and argon (or xenon), or more rarely argon-neon, or sometimes even krypton. The inner surface of the bulb is coated with a fluorescent (and often slightly phosphorescent) coating made of varying blends of metallic and rare-earth phosphor salts. 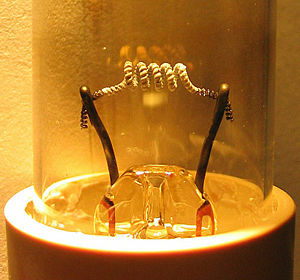 The bulb's cathode is typically made of coiled tungsten which is coated with a mixture of barium, strontium and calcium oxides (chosen to have a relatively low thermionic emission temperature). When the light is turned on, the electric power heats up the cathode enough for it to emit electrons. These electrons collide with and ionize noble gas atoms in the bulb surrounding the filament to form a plasma by a process of impact ionization. As a result of avalanche ionization, the conductivity of the ionized gas rapidly rises, allowing higher currents to flow through the lamp. The mercury, which exists at a stable vapour pressure equilibrium point of about one part per thousand in the inside of the tube (with the noble gas pressure typically being about 0.3 percent of standard atmospheric pressure), is then likewise ionized, causing it to emit light in the ultraviolet (UV) region of the spectrum predominantly at wavelengths of 253.7 nanometers and 185 nanometers. The efficiency of fluorescent lighting owes much to the fact that low pressure mercury discharges emit about 65 percent of their total light at the 254 nanometer line (also about 10-20 percent of the light emitted in UV is at the 185 nanometer line). The UV light is absorbed by the bulb's fluorescent coating, which re-radiates the energy at lower frequencies (longer wavelengths: two intense lines of 440 nanometer and 546 nanometer wavelengths appear on commercial fluorescent tubes) (see stokes shift) to emit visible light. The blend of phosphors controls the color of the light, and along with the bulb's glass prevents the harmful UV light from escaping. Fluorescent lamps are negative resistance devices, so as more current flows through them (more gas ionized), the electrical resistance of the fluorescent lamp drops, allowing even more current to flow. Connected directly to a constant-voltage mains power line, a fluorescent lamp would rapidly self-destruct due to the unlimited current flow. To prevent this, fluorescent lamps must use an auxiliary device, commonly called a ballast, to regulate the current flow through the tube. While the ballast could be (and occasionally is) as simple as a resistor, substantial power is wasted in a resistive ballast so ballasts usually use a reactance (inductor or capacitor) instead. For operation from AC mains voltage, the use of simple inductor (a so-called "magnetic ballast") is common. In countries that use 120 volt AC mains, the mains voltage is insufficient to light large fluorescent lamps so the ballast for these larger fluorescent lamps is often a step-up autotransformer with substantial leakage inductance (so as to limit the current flow). Either form of inductive ballast may also include a capacitor for power factor correction. In the past, fluorescent lamps were occasionally run directly from a DC supply of sufficient voltage to strike an arc. In this case, there was no question that the ballast must have been resistive rather than reactive, leading to power losses in the ballast resistor. Also, when operated directly from DC, the polarity of the supply to the lamp must be reversed every time the lamp is started; otherwise, the mercury accumulates at one end of the tube. Nowadays, fluorescent lamps are essentially never operated directly from DC; instead, an inverter converts the DC into AC and provides the current-limiting function as described below for electronic ballasts. More sophisticated ballasts may employ transistors or other semiconductor components to convert mains voltage into high-frequency AC while also regulating the current flow in the lamp. These are referred to as "electronic ballasts." Fluorescent lamps which operate directly from mains frequency AC will flicker at twice the mains frequency, since the power being delivered to the lamp drops to zero twice per cycle. This means the light flickers at 120 times per second (Hz) in countries which use 60-cycle-per-second (60 Hz) AC, and 100 times per second in those which use 50 Hz. This same principle can also cause hum from fluorescent lamps, actually from its ballast. Both the annoying hum and flicker are eliminated in lamps which use a high-frequency electronic ballast, such as the increasingly popular compact fluorescent bulb. Although most people cannot directly see 120 Hz flicker, some people report that 120 Hz flicker causes eyestrain and headache. Dr. J. Veitch has found that people have better reading performance using high-frequency (20-60 kHz) electronic ballasts than magnetic ballasts (120 Hz). In some circumstances, fluorescent lamps operated at mains frequency can also produce flicker at the mains frequency (50 or 60 Hz) itself, which is noticeable by more people. This can happen in the last few hours of tube life when the cathode emission coating at one end is almost run out, and that cathode starts having difficulty emitting enough electrons into the gas fill, resulting in slight rectification and hence uneven light output in positive and negative going mains cycles. Mains frequency flicker can also sometimes be emitted from the very ends of the tubes, as a result of each tube electrode alternately operating as an anode and cathode each half mains cycle, and producing slightly different light output pattern in anode or cathode mode (this was a more serious issue with tubes over 40 years ago, and many fittings of that era shielded the tube ends from view as a result). Flicker at mains frequency is more noticeable in the peripheral vision than it is in the center of gaze. The mercury atoms in the fluorescent tube must be ionized before the arc can "strike" within the tube. For small lamps, it does not take much voltage to strike the arc and starting the lamp presents no problem, but larger tubes require a substantial voltage (in the range of a thousand volts). In other cases, a separate starting aid must be provided. Some fluorescent designs (preheat lamps) use a combination filament/cathode at each end of the lamp in conjunction with a mechanical or automatic switch (see photo) that initially connect the filaments in series with the ballast and thereby preheats the filaments prior to striking the arc. These systems are standard equipment in 240-volt countries, and generally use a glowstarter. In the past, 4-pin thermal starters and manual switches were also used. Electronic starters are also sometimes used with these electromagnetic ballast fittings. During preheating, the filaments emit electrons into the gas column by thermionic emission, creating a glow discharge around the filaments. Then, when the starting switch opens, the inductive ballast & a small value capacitor across the starting switch create a high voltage which strikes the arc. Tube strike is reliable in these systems, but glowstarters will often cycle a few times before letting the tube stay lit, which causes objectionable flashing during starting. The older thermal starters behaved better in this respect. Once the tube is struck, the impinging main discharge then keeps the filament/cathode hot, permitting continued emission. If the tube fails to strike, or strikes then extinguishes, the starting sequence is repeated. With automated starters such as glowstarters, a failing tube will thus cycle endlessly, flashing time and time again as the starter repeatedly starts the worn-out lamp, and the lamp then quickly goes out as emission is insufficient to keep the cathodes hot, and lamp current is too low to keep the glowstarter open. This causes visually unpleasant frequent bright flashing, and runs the ballast at above design temperature. Turning the glowstarter a quarter turn anticlockwise will disconnect it, opening the circuit. Some more advanced starters time out in this situation, and do not attempt repeated starts until power is reset. Some older systems used a thermal overcurrent trip to detect repeated starting attempts. These require manual reset. Newer rapid start ballast designs provide filament power windings within the ballast; these rapidly and continuously warm the filaments/cathodes using low-voltage AC. No inductive voltage spike is produced for starting, so the lamps must usually be mounted near a grounded (earthed) reflector to allow the glow discharge to propagate through the tube and initiate the arc discharge. Electronic ballasts often revert to a style in-between the preheat and rapid-start styles: a capacitor (or sometimes an autodisconnecting circuit) may complete the circuit between the two filaments, providing filament preheating. When the tube lights, the voltage and frequency across the tube and capacitor typically both drop, thus capacitor current falls to a low but non-zero value. Generally this capacitor and the inductor that provides current limiting in normal operation form a resonant circuit, increasing the voltage across the lamp so that it can easily start. Some electronic ballasts use programmed start. The output AC frequency is started above the resonance frequency of the output circuit of the ballast, and after the filaments are heated the frequency is rapidly decreased. If the frequency approaches the resonant frequency of the ballast, the output voltage will increase so much that the lamp will ignite. If the lamp does not ignite an electronic circuit stops the operation of the ballast. The "emission mix" on the tube filaments/cathodes is necessary to enable electrons to pass into the gas via thermionic emission at the tube operating voltages used. The mix is slowly sputtered off by bombardment with electrons and mercury ions during operation, but a larger amount is sputtered off each time the tube is started with cold cathodes (the method of starting the lamp and hence the control gear type has a significant impact on this). Lamps operated for typically less than three hours each switch-on will normally run out of the emission mix before other parts of the lamp fail. The sputtered emission mix forms the dark marks at the tube ends seen in old tubes. When all the emission mix is gone, the cathode cannot pass sufficient electrons into the gas fill to maintain the discharge at the designed tube operating voltage. Ideally, the control gear should shut down the tube when this happens. However, some control gear will provide sufficient increased voltage to continue operating the tube in cold cathode mode, which will cause overheating of the tube end and rapid disintegration of the electrodes and their support wires until they are completely gone or the glass cracks, wrecking the low pressure gas fill and stopping the gas discharge. This is only relevant to compact fluorescent lamps with integral electrical ballasts. Ballast electronics failure is a somewhat random process which follows the standard failure profile for any electronic devices. There is an initial small peak of early failures, followed by a drop and steady increase over lamp life. Life of electronics is heavily dependent on operating temperature—it typically halves for each 10 °C temperature rise. The quoted average life is usually at 25C ambient (this may vary by country). In some fittings, the ambient temperature could be well above this, in which case failure of the electronics may become the predominant failure mechanism. Similarly, running a compact fluorescent lamp base-up will result in hotter electronics and shorter average life (particularly with higher power rated ones). Electronic ballasts should be designed to shut down the tube when the emission mix runs out as described above. In the case of integral electronic ballasts, since they never have to work again, this is sometimes done by having them deliberately burn out some component to permanently cease operation. The phosphor drops off in efficiency during use. By around 25,000 operating hours, it will typically be half the brightness of a new lamp (although some manufacturers claim much longer half-lives for their lamps). Lamps that do not suffer failures of the emission mix or integral ballast electronics will eventually develop this failure mode. They still work, but have become dim and inefficient. The process is slow, and often only becomes obvious when a new lamp is operating next to an old lamp. Mercury is lost from the gas fill throughout the lamp life as it is slowly absorbed into glass, phosphor, and tube electrodes, where it can no longer function. Historically this hasn't been a problem because tubes have had an excess of mercury. However, environmental concerns are now resulting in low mercury content tubes which are much more accurately dosed with just enough mercury to last the expected life of the lamp. This means that loss of mercury will take over from failure of the phosphor in some lamps. The failure symptom is similar, except loss of mercury initially causes an extended run-up time (time to reach full light output), and finally causes the lamp to glow a dim pink when the mercury runs out and the argon base gas takes over as the primary discharge. Many people find the color spectrum produced by some fluorescent tubes to be harsh and displeasing. A healthy person can sometimes appear to have a sickly looking washed out skin tone under fluorescent lighting. This is due to two things. The first cause is the use of poor light quality low-CRI high-CCT tubes, such as “cool white.” These have poor light quality, producing a lower than ideal proportion of red light, hence skin appears to have less pink coloration than it would under better lighting. The second cause is due to the characteristics of the eye and tube type. High-CCT natural daylight looks a natural color at daylight illumination levels, but as light level is reduced it appears progressively colder to the eye. At lower illumination levels, the human eye perceives lower color temperatures as normal and natural. Most fluorescent tubes are higher color temperature than 2700 K filament lighting, and cooler tubes don't look natural to the eye at far below daylight illumination levels. This effect depends on the tube phosphor, and only applies to the higher CCT tubes at well below natural daylight levels. Many pigments appear a slightly different color when viewed under some fluorescent tubes versus incandescent. This is due to a difference in two properties, CCT and CRI. The CCT, color cemperature, of GLS filament lighting is 2700 K, and that of halogen lighting 3000 K, whereas fluorescent tubes are popularly available in the range from 2700 K to 6800 K, which represents a fair variation perceptually. CRI, color rendition index, is a measure of how well balanced the different color components of the white light are. A lamp spectrum with the same proportions of R,G,B as a black body radiator has a CRI of 100 percent, but fluorescent tubes achieve CRIs of anywhere from 50 percent to 99 percent. The lower CRI tubes have a visually low quality unbalanced color spectrum, and this produces some change in perceived color. For example a low CRI 6800 K halophosphate tube, which is about as visually unpleasant as they get, will make reds appear dull red or brown. Some of the least pleasant light comes from tubes containing the older halophosphate type phosphors (chemical formula Ca5(PO4)3(F,Cl):Sb3+,Mn2+), usually labelled as "cool white." The bad color reproduction is due to the fact that this phosphor mainly emits yellow and blue light, and relatively little green and red. To the eye, this mixture appears white, but the light has an incomplete spectrum. Better quality fluorescent lamps use either a higher-CRI halophosphate coating, or a triphosphor mixture, based on europium and terbium ions, that have emission bands more evenly distributed over the spectrum of visible light. High-CRI halophosphate and triphosphor tubes give a more natural color reproduction to the human eye. Typical fluorescent lamp with "rare earth" phosphor A typical "cool white" fluorescent lamp utilizing two rare earth doped phosphors, Tb3+, Ce3+:LaPO4 for green and blue emission and Eu:Y2O3 for red. For an explanation of the origin of the individual peaks click on the image. Note that several of the spectral peaks are directly generated from the mercury arc. This is likely the most common type of fluorescent lamp in use today. An older style halophosphate phosphor fluorescent lamp Halophosphate phosphors in these lamps usually consist of trivalent antimony and divalent manganese doped calcium halophosphate (Ca5(PO4)3(Cl,F):Sb3+, Mn2+). The color of the light output can be adjusted by altering the ratio of the blue emitting antimony dopant and orange emitting manganese dopant. The color rendering ability of these older style lamps is quite poor. Halophosphate phosphors were invented by A. H. McKeag et al. in 1942. "Natural sunshine" fluorescent light An explanation of the origin of the peaks is on the image page. Yellow fluorescent lights The spectrum is nearly identical to a normal fluorescent bulb except for a near total lack of light below 500 nanometers. This effect can be achieved through either specialized phosphor use or more commonly by the use of a simple yellow light filter. These lamps are commonly used as lighting for photolithography work in cleanrooms and as "bug repellant" outdoor lighting (the efficacy of which is questionable). Spectrum of a "blacklight" bulb There is typically only one phosphor present in a blacklight bulb, usually consisting of europium-doped strontium fluoroborate which is contained in an envelope of Wood's glass. Fluorescent light bulbs come in many shapes and sizes. An increasingly popular one is the compact fluorescent light bulb (CF). 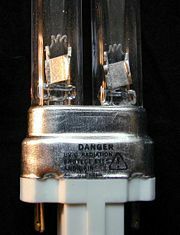 Many compact fluorescent lamps integrate the auxiliary electronics into the base of the lamp, allowing them to fit into a regular light bulb socket. In the U.S., residential use of fluorescent lighting remains low (generally limited to kitchens, basements, hallways and other areas), but schools and businesses find the cost savings of fluorescents to be significant and only rarely use incandescent lights. Lighting arrangements often use fluorescent tubes in an assortment of tints of white. In most cases this is due to failure to appreciate the difference or importance of differing tube types. Mixing tube types within fittings is also done to improve the color reproduction of low quality tubes. In other countries, residential use of fluorescent lighting varies depending on the price of energy, financial and environmental concerns of the local population, and acceptability of the light output. In February 2007, Australia enacted a law that will ban most sales of incandescent light bulbs by 2010. While the law does not specify which alternative Australians are to use, compact fluorescents are likely to be the primary replacements. Because fluorescent lamps contain mercury, a toxic heavy metal, governmental regulations in many areas require special disposal of fluorescent lamps, separate from general and household wastes. Mercury poses the greatest hazard to pregnant women, infants, and children. Landfills often refuse fluorescent lamps due to their high mercury content. Households and commercial waste sources are often treated differently. The amount of mercury in a standard lamp can vary dramatically, from 3 to 46 mg. A typical 2006-era four-foot (120-centimeter) T-12 fluorescent lamp (namely, F32T12) contains about 12 milligrams of mercury. Newer lamps contain less mercury, and the 3-4 milligram versions (such as F32T8) are sold as low-mercury types. A broken fluorescent tube is more hazardous than a broken conventional incandescent bulb due to the mercury content. Because of this, the safe cleanup of broken fluorescent bulbs differs from cleanup of conventional broken glass or incandescent bulbs. Ninety-nine percent of the mercury is typically contained in the phosphor, especially on lamps that are near their end of life. Therefore, a typical safe cleanup usually involves careful disposal of any broken glass, as well as any loose white powder (fluorescent glass coating), in accordance with local hazardous waste laws. A wet towel is normally used instead of a vacuum cleaner for cleanup of glass and powder, mainly to reduce the spread of the powder throughout the air. Fluorescent lamps are more efficient than incandescent light bulbs of an equivalent brightness. This is because more of the consumed energy is converted to usable light and less is converted to heat, allowing fluorescent lamps to run cooler. An incandescent lamp may convert only 10 percent of its power input to visible light. A fluorescent lamp producing as much useful visible light energy may require only one-third to one-fourth as much electricity input. Typically a fluorescent lamp will last between 10 and 20 times as long as an equivalent incandescent lamp. Where lighting is used in air-conditioned spaces, all the lamp losses must also be removed by the air conditioning equipment, resulting in a double penalty for losses due to lighting. The higher initial cost of a fluorescent lamp is more than compensated for by lower energy consumption over its life. The longer life may also reduce lamp replacement costs, providing additional saving especially where labor is costly. Therefore it is widely used by businesses worldwide, but not so much by households. The mercury released to the air when 5 to 45 percent of the fluorescent lamps are disposed of, is offset by the fact that many coal-fired electricity generators emit mercury into the air. The greater efficiency of fluorescent lamps helps to reduce powerplant emissions. 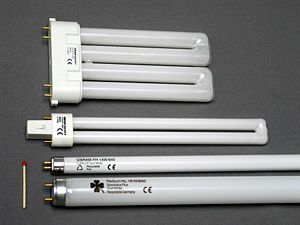 Fluorescent lamps require a ballast to stabilize the lamp and to provide the initial striking voltage required to start the arc discharge; this increases the cost of fluorescent luminares, though often one ballast is shared between two or more lamps. Certain types of ballasts produce audible humming or buzzing noises. Conventional lamp ballasts do not operate on direct current. If a direct current supply with a high enough voltage to strike the arc is available, a resistor can be used to ballast the lamp but this leads to low efficiency because of the power lost in the resistor. Also, the mercury tends to migrate to one end of the tube leading to only one end of the lamp producing most of the light. Because of this effect, the lamps (or the polarity of the current) must be reversed at regular intervals. Fluorescent lamps operate best around room temperature (say, 68 degrees Fahrenheit or 20 degrees Celsius). At much lower or higher temperatures, efficiency decreases and at low temperatures (below freezing) standard lamps may not start. Special lamps may be needed for reliable service outdoors in cold weather. A "cold start" electrical circuit was also developed in the mid-1970s. Because the arc is quite long relative to higher-pressure discharge lamps, the amount of light emitted per unit of surface of the lamps is low, so the lamps are large compared with incandescent sources. This affects design of fixtures since light must be directed from long tubes instead of a compact source. However, in many cases low luminous intensity of the emitting surface is useful because it reduces glare. Fluorescent lamps do not give out a steady light; instead, they flicker (fluctuate in intensity) at a rate that depends on the frequency of the driving voltage. While this is not easily discernible by the human eye, it can cause a strobe effect posing a safety hazard in a workshop for example, where something spinning at just the right speed may appear stationary if illuminated solely by a fluorescent lamp. It also causes problems for video recording as there can be a 'beat effect' between the periodic reading of a camera's sensor and the fluctuations in intensity of the fluorescent lamp. The frequency is most noticeable on CRT computer monitors set with a refresh rate similar to the frequency of the bulbs, which will appear to flicker due to the beat effect. To resolve this flicker one may change their monitor's refresh rate. Incandescent lamps, due to the thermal inertia of their element, fluctuate less in their intensity, although the effect is measurable with instruments. This is also less of a problem with compact fluorescents, since they multiply the line frequency to levels that are not visible. Installations can reduce the stroboscope effect by using lead-lag ballasts or by operating the lamps on different phases of a polyphase power supply. The problems with color faithfulness are discussed above. Unless specifically designed and approved to accommodate dimming, most fluorescent light fixtures cannot be connected to a standard dimmer switch used for incandescent lamps. Two effects are responsible for this: the waveshape of the voltage emitted by a standard phase-control dimmer interacts badly with many ballasts and it becomes difficult to sustain an arc in the fluorescent tube at low power levels. Many installations require 4-pin fluorescent lamps and compatible controllers for successful fluorescent dimming; these systems tend to keep the cathodes of the fluorescent tube fully heated even as the arc current is reduced, promoting easy thermionic emission of electrons into the arc stream. The disposal of phosphor and the small amounts of mercury in the tubes is also an environmental problem, compared with the disposal of incandescent lamps. For large commercial or industrial users of fluorescent lights, recycling services are beginning to become available. Note: the information in this section might be inapplicable outside of North America. Lamps are typically identified by a code such as F##T##, where F is for fluorescent, the first number indicates the power in watts (or strangely, length in inches in very long lamps), the T indicates that the shape of the bulb is tubular, and the last number is diameter in eighths of an inch. Typical diameters are T12 (1½ inches or 38 millimeters) for residential bulbs with old magnetic ballasts, T8 (1 inch or 25 millimeters) for commercial energy-saving lamps with electronic ballasts, and T5 (5⁄8 inches or 16 millimeters) for very small lamps which may even operate from a battery-powered device. Slimline lamps operate on an instant start ballast and are recognizable by their single-pin bases. High-output lamps are brighter and draw more electrical current, have different ends on the pins so they cannot be used in the wrong fixture, and are labeled F##T12HO, or F##T12VHO for very high output. Since about the early to mid 1950s to today, General Electric developed and improved the Power Groove lamp with the label F##PG17. These lamps are recognizable by their large diameter, grooved tubes. U-shaped tubes are FB##T##, with the B meaning "bent." Most commonly, these have the same designations as linear tubes. Circular bulbs are FC##T#, with the diameter of the circle (not circumference or watts) being the first number, and the second number usually being 9 (29 mm) for standard fixtures. Color is usually indicated by WW for warm white, EW for enhanced (neutral) white, CW for cool white (the most common), and DW for the bluish daylight white. BL is often used for blacklight (commonly used in bug zappers), and BLB for the common blacklight-blue bulbs which are dark purple. Other non-standard designations apply for plant lights or grow lights. Odd lengths are usually added after the color. One example is an F25T12/CW/33, meaning 25 watts, 1.5-inch diameter, cool white, 33 inches or 84 centimeters long. Without the 33, it would be assumed that an F25T12 is the more-common 30 inches long. Compact fluorescents do not have such a designation system. Blacklights are a subset of fluorescent lamps that are used to provide long-wave ultraviolet light (at about 360-nanometer wavelength). They are built in the same fashion as conventional fluorescent lamps but the glass tube is coated with a phosphor that converts the short-wave UV within the tube to long-wave UV rather than to visible light. They are used to provoke fluorescence (to provide dramatic effects using blacklight paint and to detect materials such as urine and certain dyes that would be invisible in visible light) as well as to attract insects to bug zappers. So-called blacklite blue lamps are also made from more expensive deep purple glass known as Wood's glass rather than clear glass. The deep purple glass filters out most of the visible colors of light directly emitted by the mercury-vapor discharge, producing proportionally less visible light compared with UV light. This allows UV-induced fluorescence to be seen more easily (thereby allowing blacklight posters to seem much more dramatic). Sun lamps contain a different phosphor that emits more strongly in medium-wave UV, provoking a tanning response in most human skin. Grow lamps contain a phosphor blend that encourages photosynthesis in plants; they usually appear pinkish to human eyes. Germicidal lamps contain no phosphor at all (technically making them gas discharge lamps rather than fluorescent) and their tubes are made of fused quartz that is transparent to the short-wave UV directly emitted by the mercury discharge. The UV emitted by these tubes will kill germs, ionize oxygen to ozone, and cause eye and skin damage. Besides their uses to kill germs and create ozone, they are sometimes used by geologists to identify certain species of minerals by the color of their fluorescence. When used in this fashion, they are fitted with filters in the same way as blacklight-blue lamps are; the filter passes the short-wave UV and blocks the visible light produced by the mercury discharge. They are also used in EPROM erasers. Cold-cathode fluorescent lamps are used as backlighting for liquid crystal displays in personal computer and TV monitors. Special fluorescent lights are often used in film/video production. The brand name Kino Flos are used to create softer fill light and are less hot than traditional halogen light sources. These fluorescent lights are designed with special high-frequency ballasts to prevent video flickering and high color-rendition index bulbs to approximate daylight color temperatures. Many believe that a Filipino named Agapito Flores was the original inventor of the fluorescent light. It is reported that that he received a French patent for his invention and sold it to General Electric, which made millions of dollars from his idea. Flores however presented his patent to General Electric after the company had already presented the fluorescent light to the public, and much after it was originally invented. ↑ Lightsearch.com. Light Guide: Fluorescent Ballasts. Adapted from the Advanced Lighting Guidelines originally published by the California Energy Commission, 1993. Retrieved May 31, 2007. ↑ National Research Council Canada, Fluorescent Lamp Flicker. Retrieved May 31, 2007. ↑ Todd Woody, “Australia bans traditional light bulbs to combat global warming.” Green Wombat. February 20, 2007. Retrieved May 31, 2007. ↑ “World first! Australia slashes greenhouse gases from inefficient lighting.” Office of the Australian Minister for the Environmental and Water Resources. Press release (February 20, 2007). Retrieved May 31, 2007. ↑ United Nations Environment Programme, “Toolkit for identification and quantification of mercury releases.” p. 183. Retrieved May 31, 2007. ↑ Lighting Design Lab, Mercury in Fluorescent Lamps. Retrieved May 31, 2007. ↑ Floyd et al. (2002). Quoted in United Nations Environment Programme, “Toolkit for identification and quantification of mercury releases” p. 184. Retrieved February 10, 2012. ↑ United Nations Environment Programme. “Toolkit for identification and quantification of mercury releases.” p. 184. Retrieved May 31, 2007. ↑ Agapito Flores: About.com Inventors. Retrieved May 31, 2007. All links retrieved April 14, 2017. How Stuff Works: Are fluorescent bulbs really more efficient than normal light bulbs? Thayer, R. N. The Fluorescent Lamp: Early U. S. Development The Report courtesy of General Electric Company. This page was last modified on 14 April 2017, at 19:55.